After knocking around 11 promotional packs of Nice 'n' Easy dye's off the shelf in Superdrug last week, I knew that I could at least be courteous and buy one. I was actually enticed by the packaging before my little misdemeanour, I love the branding of the 'Sunkissed' range - it really sells to me the ultimate beach babe donning a mane of golden highlighted tresses. I have used Nice 'n' Easy dyes before mainly for the luxurious conditioner that comes in the box, you can actually now buy that separate in Boots and Superdrug. I have found previously that the dyes can be a little drying on the hair and all of the blondes packs that I have previously used have tended to turn my hair a vague shade of snot green. 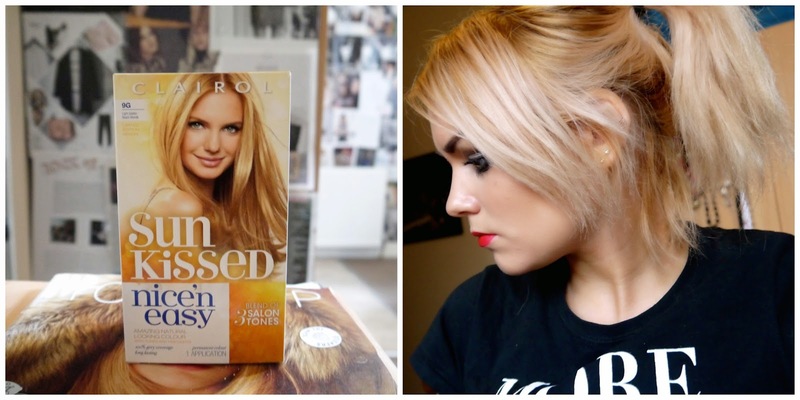 The 'Light Golden Beach Blonde' shade is my new favourite hair dye by far. The blend of 3 tones distributes honey blonde, beige blonde and warm blonde through the hair leaving you looking like you've spent the last two hours in foils.